" ... The first instrument consisted of 15 whistles, of graduated sizes, attached in a row to the top of a small steam boiler. A long cylinder with pins of different shapes driven into it ran the length of the boiler. The pins were so arranged that when the cylinder revolved, they pressed the valves and blew the whistles in proper sequence. The different shapes enabled the operator to play notes of varying length. 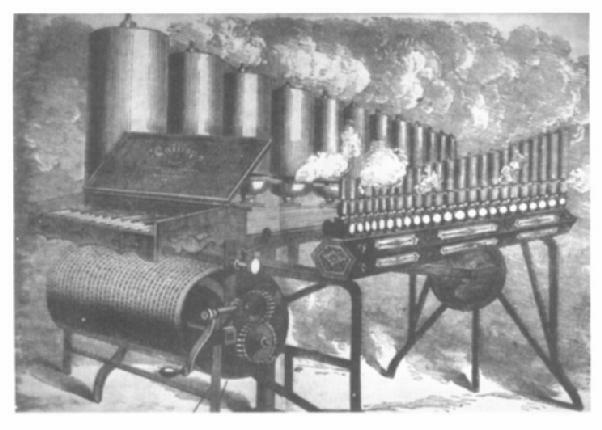 Later, Stoddard replaced the cylinder with a keyboard. Wires running from the keys to the valves enabled the operator to play the instrument like a piano." Here's a collections of images and articles on Steam Calliopes and Air Calliopes. For the time being, there's no particular order. Check back from time to time for additional entries. "New Age" Air Calliope by Melville McBride, Aptos, Calif.
Click to hear a calliope playing "Stars and Stripes Forever"
Copyright (C) 1998 by J. L. Stubbs, used by permission.